That was a snippet from a recent conversation with fly fisherman, guide, and business owner Tom Conway. He confirmed what I had been hearing: that women take to fly fishing faster than men, and in many cases, outcast their male counterparts. Earlier this week I visited the Ausable River Two Fly Shop in Wilmington, New York. This Adirondack hamlet is home to Whiteface Mountain, a growing spiderweb of mountain biking trails, camp sites, restaurants, and the famed Ausable River. Each spring, anglers from around the world come here to fish what is considered one of the best trout streams. It's a diverse waterway with large amounts of pocket water, and as any local angler will tell you, this is where the best trout live. Tom, an avid fisherman, owns the shop that stocks items I’d never heard of, like felt-bottomed boots, partridge hackle, and ice dubs (the latter two are items needed to make artificial flies). 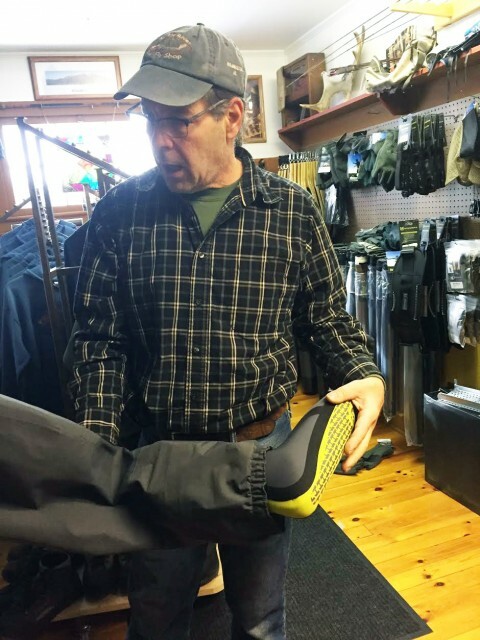 Recently he began carrying women-specific gear like hip waders and jackets. “Well, women and men are not shaped the same and may need extra room in certain areas,” he said. Don’t I know it, I thought. Typically, a fly fisherman is standing in knee to waist deep water, and casting the line at a target on the water. Novices can get the line anywhere from 10-30 feet away, while an accomplished fisherman can make the line fly through the air like a slow moving missile with precise placement 60 feet in distance. The back and forth motion of the rod and line, and hitting the designated target takes time and practice. “Women don’t try to force it. They take their time, are more gentle and graceful,” he said. “Often their form is better than men and that is why they are outcasting them. Tom said a woman named Joan Wulff is considered the First Lady of Fly Fishing and eventually started a fly fishing school in the Catskills. Wulff has taught countless people the art of fly-casting through the school she founded and the books she has written. 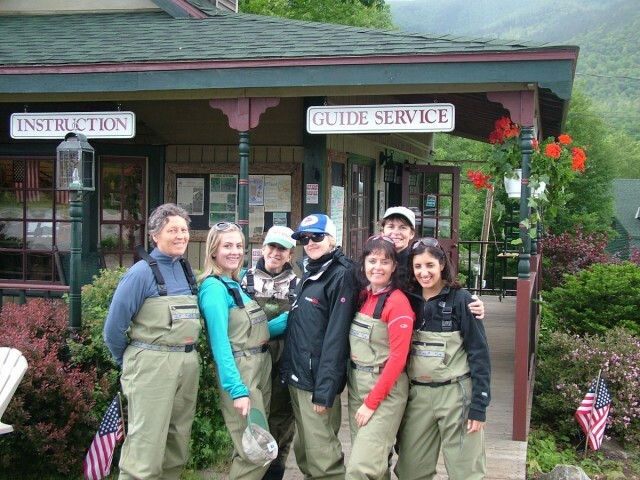 Since then, women have become CEOs of fly fishing manufacturers, founded their own fly fishing companies and guide services, and created well-respected podcasts and blogs on the topic. And the numbers are increasing. Fly fishing manufacturers have taken notice of the increased popularity among females and are now making female specific gear. Tom’s shipment arrived recently. He said the waterproof waders and jackets are roomier in the hips/thighs area. The fly rods come with smaller grips, and the boots are now offered in women’s sizes. In general, boots come with felted bottoms or are made of rubber with studded cleats for better traction for both men and women. His business season is roughly April 1 through October 15. During that time, he keeps his shop open 7 days per week and rents gear to those interested in giving it a go. He also owns a guide service and strongly suggests beginners to get some instruction to build a skill set. 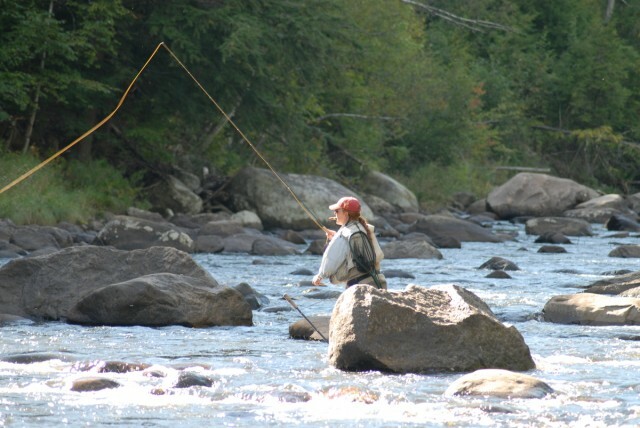 The Whiteface Region has plenty of lodging properties and dining options catering to anglers. Check out the annual Ausable River Two-Fly Challenge while you're here, and be sure to visit the numerous area establishments currently offering fishing packages for your next getaway. Chances are the property owners do a little fishing themselves and will be glad to offer up some local knowledge to point you in the right direction.